Hello and welcome to Cork Wines and Spirits, where it is more than just drinking but really about the people and long lasting relationships surrounding it. We are the Wine Guys of Hoboken with over 45 years of combined wine knowledge; we bring you the Cork Experience. We believe businesses today must change. Cork reintroduces The Shopkeeper- remember walking into your local shop finding the wine guy, saying hello, calling you by name, asking you about your family telling you about the new and exciting items we just found, while roaming the store picking your selection. The shopkeeper will do just that and more. Cork is a place where patrons are not a number in a history sales program, instead our customers are known by their name. After thousands of wines tasted, and many miles traveled we believe we found an eclectic and changing selection of wines from some of the smallest villages around the world. We have a penchant for great wines and spirits. Our selection will include craft beers, unique fine spirits, and a selection of drinks ingredients and related tools that any Mixologist would be impressed with. Our goal is to improve your knowledge of wines and spirits in a relaxed and comfortable environment without intimidation. Whether you are a beginner or a fine connoisseur we have something for you. Cork not only brings you great wines but will show you why we picked them. The responsible enjoyment of wine wines and spirits is an enjoyable lifestyle. We aim to build friendly and long lasting relationships. One thing we know, wine always tastes better with friends and family. There is a plethora of beautiful and great wines around the world waiting to be discovered, we ask for your participation in helping us find them. At Cork, everyone walking in is a relationship waiting to happen. Mike brings over twenty five years of experience in the Wine and Spirits Industry. He is responsible for the day-to-day operations and principal buyer. He has tasted thousands of wines a year for many years and travels to vineyards throughout the world. Mike loves the sense of discovery and is never afraid to buy a good wine from an unlikely place or an unknown grape. He works hard with suppliers to insure that pricing remains competitive across the board so customers can enjoy great value. Mike is in charge of customer service , corporate sales, and special events. He is a people person and is committed to the highest level of customer service. 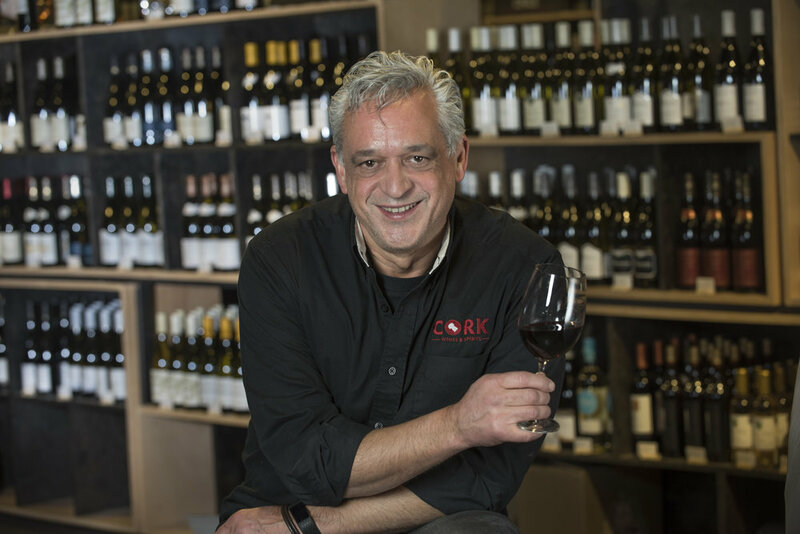 Jay Emminger, a classically trained Chef, began his formal wine education in 1982 through the American Culinary Federation Apprenticeship Program. After extensive training Jay joined the Ritz Café in Seattle, Washington as the Sous chef and has held subsequent positions including Catering Director for the Riese Organization in New York City. Working in the food industry cultivated a passion for wine knowledge and lead to the launch of his consultancy “Tastingnotes” in 1994 which grew to include Forbes, Reebok, Ralph Lauren, N.Y.U. ,Fordham University, private collectors and merchants Sparrow Wine and Liquor Co., Village Wine & Spirits, Bedford Wine Merchants, Sea Grape, and California wine merchants. Jay is currently the Consulting Wine Director (“The Wine Guy”) for the just opened “Cork Wine & Spirits”, Hoboken and the soon to open Harrison, NJ store. Jay works closely with Mike Garcia (the other “Wine Guy”) and one of the founders of Cork, to curate a broad unique selection of wine beer and spirits, along with a strong customer service experience. Carlos Ramos has always been in the customer experience business. In 1995 Carlos was the store manager and Sous Chef of Cucina Roberto’s in Hoboken, managing client relations for special events and catering as well as running day to day operations. Carlos gained a reputation for being helpful and pleasant with customers and that reputation lead him to his next customer experience job as the general manager for Sparrow Wine and Spirits (Hoboken). Over the next 11 next year’s Carlos continued to refine his skills at helping customers have the kind of experience anyone would want while helping to grow the business. In 2010 Carlos was recruited by one of the largest wine and liquor distributors in the United States, (Federal Wine & Liquor Co). As a product represented Carlos used his skill as a buyer of wine, beer, and liquor for the last 11 years to help him understand his customers’ needs and quickly earned him a spot in the million dollar club. In 2013 Carlos got a call asking him if he would like to be the general manger of a new wine, beer, and liquor shop in Hoboken, and Harrison that was making the customer experience a cornerstone of how business was going to be done. Carlos is the General manger of Cork Wine & Spirits since its opening in 2014 and he has come back to what he truly is great at and loves the customer experience.